Many wild animals animals such as alligators, snakes and birds of prey eat meat as part of their diet. Frogs and even some plants eat meat in the form of insects. These life forms are carnivorous ( flesh-eating or predatory) but are not technically carnivores. True carnivores, of the Order Carnivora, are all mammals with fur. They give birth to live young, and nurse them on milk from the mother. Their digestive systems are designed for processing meat, not plant matter, and they have sharp teeth and claws to capture their food. Their energy and nutrient requirements are obtained from eating meat. Carnivores generally have eyes that face forward, providing binocular vision and depth perception to hunt down prey. In contrast, the grass eaters they prey on have eyes set on the sides of their head, giving them a 360 degree field of vision to watch for predators as they graze. Some carnivores, such as the raccoons and bears, eat a great deal of plant matter – berries, fruit, roots – but are still classed as Carnivores. The Order Carnivora contains over 260 species which range in size from the Least Weasel (Mustela nivalis) who weighs as little as 25 grams (0.88 oz), to the 1,000 kg (2,200 lb) Polar Bear (Ursus maritimus). They are found on every continent except Antarctica. Wolverine conservation in the Canadian Rockies is taking a new turn, and you can become a citizen scientist helping these magnificent creatures! Our research is situated in the heart of the Canadian Rocky Mountains. This vast area is recognized as critical for harboring important source populations that potentially disperse to and populate more fragmented and disturbed ecosystems to the south, east and west. However, the bustling 4-lane Trans-Canada Highway is recognized as a lethal barrier to wildlife and a fracture zone for population connectivity. As the expansion of the TCH moves up Banff National Park’s Bow Valley, it becomes the first attempt ever to introduce highway mitigation at the spine of the Continental Divide and within core wolverine habitat. We know wolverines are highly sensitive to human disturbance. There is anecdotal information they rarely cross even 2-lane highways. Given highway expansion projects planned in wolverine range in the US and Canada, it will be critical to understand how growing transportation networks affect wolverine movement and gene flow within the natural connected habitat network they rely on for continued survival. The goal of our work is to noninvasively genetically sample the wolverine population in Central Canadian Rockies to assess whether gene flow and movement of individuals is blocked by a major transportation corridor. 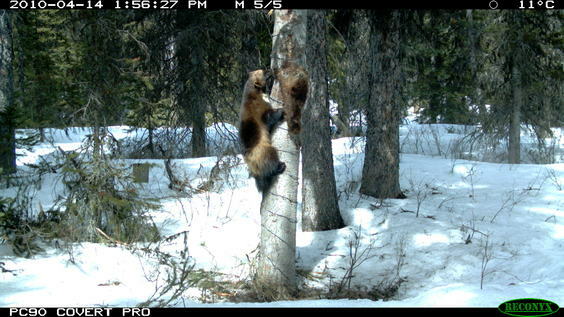 We surveyed the wolverine population during winter 2010-11, and will repeat the survey this winter (2012-13). We are collecting information on their occurrence (from cameras) and population genetics (from noninvasive hair sampling). However, funding limitations have hampered our ability to extract the most data from our extensive hair sampling effort. Our findings will be used to inform transportation practitioners planning the design of highways within wolverine range. During our winter 2010-11 survey, we skied over 2000 kms, working in teams of two, and more on long backcountry trips. By May, we collected thousands of the most beautiful and curious wolverine photographs you could imagine, AND 900+ hair samples, of which 125 were analyzed for wolverine DNA. Given the hard work we and the citizen scientists put into hair sampling: deep snow, bitter cold, and long work days with short daylengths, we must mine our data to it’s fullest. Because of budget constraints, last winter only analysed a fraction of the samples. The cost of DNA extraction, species and individual identification (and gender) is $95/sample. We are preparing for our final survey and season of sampling, which wil run from December through April. With our funding goal realized, we will be able to analyze 100 samples, double from last year. This will provide a more thorough and accurate genetic analysis of highway effects, and will make many hard-working volunteers smile at the end of the day. The Wild Carnivore has made a generous pledge towards conservation of our favourite animal, and we urge you to join us! Click here to pledge any amount you can – the wolverines will thank you. The Committee on the Status of Endangered Wildlife in Canada (COSEWIC) held their spring species assessment meeting last week in the Kananaskis Valley of Alberta. 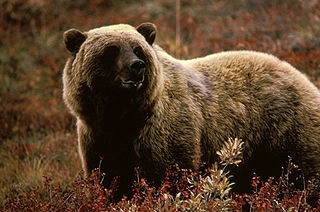 The committee considered the status of 35 wildlife species, including our iconic grizzly bear. The global distribution of this large-bodied carnivore has declined by over 50% since the 1800s, with western Canada representing a significant core of the current North American range. A habitat generalist, its distribution and abundance in the absence of humans is largely driven by habitat productivity and seasonality. It is highly sensitive to human disturbance and is subject to high mortality risk in areas of human activity and where roads create access. Population estimates in much of the range are highly uncertain; the Canadian population is estimated at 26,000, but the number of mature individuals is uncertain and could be closer to 10,000. While there is no evidence of a decline in the overall population during the past 20 years and increasing numbers of records indicating some range expansion in the north, a number of populations in the southern extent of its range in Alberta and southern BC are known to be declining and there are concerns about unsustainable mortality rates there and in parts of Yukon. There is strong evidence of genetic fragmentation in the southern parts of its range where some populations are increasingly isolated. Their poor condition in some parts of the range, combined with their naturally low reproductive rates and increasing pressures of resource extraction in currently intact parts of the range, heighten concern for this species if such pressures are not successfully reversed. The species was considered a single unit and designated Not at Risk in April 1979. Split into two populations in April 1991 (Prairie population and Northwestern population). The Prairie population was designated Extirpated in April 1991. The Northwestern population was designated Special Concern in April 1991 and confirmed in May 2002. In May 2012, the entire species was re-examined and the Prairie and Northwestern populations were again considered a single unit. This newly-defined Western population was designated Special Concern in May 2012. COSEWIC is a committee of experts that assesses and designates which wildlife species are in danger of disappearing from Canada. The process is divided into three sequential steps, each of which has a tangible outcome. The steps are outlined briefly below, and more detail is provided on the web page detailing COSEWIC’s assessment process. The deadline for Canadians to comment on the federal government’s massive wolf-kill caribou recovery strategy is February 22, 2012. For most Alberta boreal woodland caribou herds, the wolf-kill strategy would allow 95% of their habitat to be destroyed. Tar sands and other oil-gas activities in those herds’ ranges would not be disturbed. Alberta Wilderness Association (AWA) is inviting Canadians to ask Environment Minister Peter Kent to protect the habitat caribou require for long-term survival and recovery, rather than encouraging decades-long poisoning and shooting of many thousands of wolves. 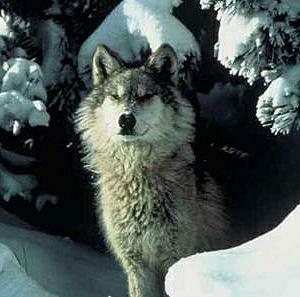 In healthy forests, wolf predation does not significantly affect caribou, points out Campbell. “These caribou are spread thinly across the landscape and do not support wolf populations in themselves,” she says. Industrial development upsets this fine balance, bringing in larger numbers of other prey such as deer and moose and creating easy access corridors for wolves, resulting in more caribou being killed by wolves. Scientific studies agree that the only long-term solution for caribou is to have enough intact habitat to allow them to remain separated from deer, moose and wolves. AWA asks Canadians to call on Environment Minister Kent to set sensible limits on forest disturbance in caribou ranges, and restore necessary habitat, as the first focus of the recovery strategy, rather than encourage massive wolf kills. Wolverines are in the local news again! A wolverine has finally used a wildlife overpass to get across the deadly TransCanada Highway in Banff National Park – the first recorded crossing in 15 years for this species. It’s the first time a wolverine has ever been photographed on one of the multi-million-dollar overpass structures in Banff, which were built to stop roadkill, help animals access critical habitat and keep populations connected. Read more about the highway passes that have seen 200,000 crossings by wildlife, including grizzly and black bears, wolves and ungulates. This is a tiny fraction of the amazing photos of wildlife that have been captured in the last 15 years on wildlife crossing structures that span the Trans-Canada Highway in Banff National Park. You should know now that wolverines will be featured often on this blog. The animal wolverine, not the one with the metal blades in his hands. These almost-mythical, cantankerous denizens of the deep boreal forest are my favorite carnivore. My Wild Carnivore website has been sending a percentage of proceeds from the sale of my wolverine t shirt to The Wolverine Foundation since I started the site. I have books, videos and scientific papers on wolverines. If you’re reading this blog, get ready for wolverines. The wolverine is an icon of Canadian wilderness. They are most commonly associated with areas where human disturbance is low, but we know relatively little about why this is or what future development and climate change might mean to this species. They will battle a grizzly bear for food, but will they be able to take on industrial development or changing snow conditions? Volunteers and citizen science can help us find out. For this project, volunteers from the Alberta Trappers’ Association will participate in a unique initiative by collecting information on where wolverines live, the type of habitat that is important, and the obstacles they face in an uncertain future. Trappers, who wish to protect wilderness for future generations, will identify wolverine tracks and monitor remote camera stations. The non-invasive (live) collection of hair samples from hair snag stations will provide DNA. Alberta Conservation Association (ACA) biologists will use these pieces of information to assess habitat occupancy and population size. Habitat change modelling predictions and location information from collared wolverines will be incorporated into our online communication to show the size of area and habitat features that need to be protected for wolverine populations to remain healthy. This will be part of an education campaign to engage the public in protecting key wilderness areas. ACA will ensure that volunteer-produced information is collected consistently and accurately. This will enable us to combine the best on-the-ground knowledge with scientific data to produce results that will be accepted and understood by a wide audience. The latest Project Update reveals how they managed to capture DNA samples by clipping some hair from a male wolverine. Not the usual method, but it appears to be effective! Check their rare photographs of a wild wolverine. The good folks at The Bear Study group have been monitoring a female black bear named Jewel in her winter den. This past weekend, Jewel increased the black bear population by two. The tiny little cubs are hard to see at first, but you can certainly hear them when they’re born! The Wildlife Research Institute is conducting the longest and most detailed black bear study and the largest educational outreach program ever for black bears. Keep an eye on their black bear den cam to follow the growth of these newest of carnivores! The world’s large predators – bears, tigers, lions – are in trouble. They are disappearing worldwide, on a fast slide towards extinction. The smaller carnivores of the world are on the same slide, just at a slower rate. It’s not just the loss of the large predators that can have an effect on human health. Small wild cats, birds of prey, coyotes and other carnivores feed on mice and rats that destroy crops and spread disease. In spite of all the scientific evidence, governments in many countries – among them Canada and the USA (wolves) and Argentina (puma) – are still adamant that predators be wiped out. They are still the scapegoats for anything that goes wrong in nature, and their removal is the first knee-jerk reaction taken by officials. It’s time governments started acknowledging the scientific evidence showing we have to pay attention to the well being of predators if we want healthy ecosystems, and a healthy planet. I should first clarify that incredible photo of animal tracks in the snow was (unfortunately) not taken by me. It was taken by a friend, who with his sons, was visiting northern Alberta earlier this month. They saw these marks in the snow and were completely stumped as to what could have made them. They mentioned their sightings to a local man, and he said he had seen similar tracks earlier in the week and was equally stumped. Then he walked around a bend in the road and saw the culprits – a pair of Northern River Otters. Thse playful little animals are active year round, even when water freezes in winter. They are mainly nocturnal, with some activity at dusk and dawn, and you have to be incredibly lucky to see one in the wild. North American River Otters typically travel in water and are able to swim long distances under ice during the winter. Family groups may travel long distances over land from one watershed to another. When traveling on land, they often slide instead of bounding, especially if snow is present, or when going downhill on slippery ground. When snow sliding, they push forward with their back legs, while the front feet are tucked under the belly. I managed to find this video on YouTube that gives a clear picture of how those tracks were made in the Jan 6 photo. How cool are these animals?! 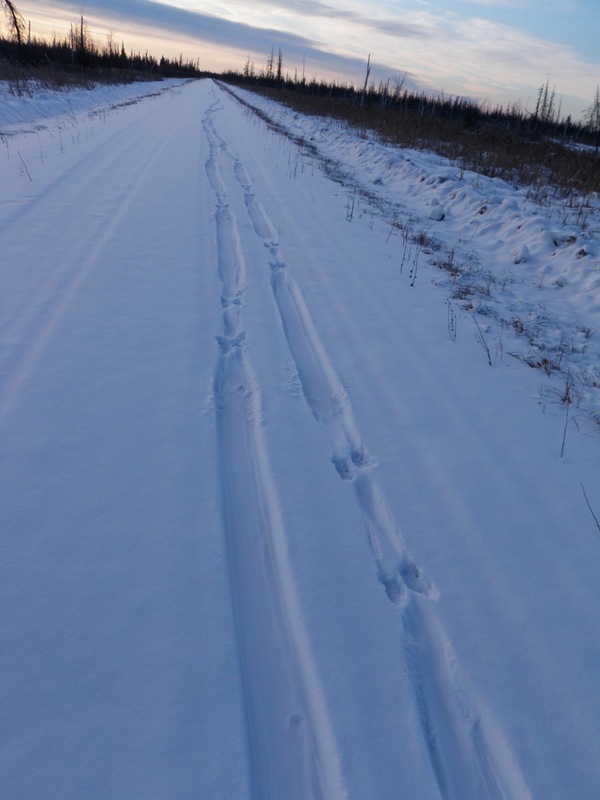 What kind of critter do you think left these tracks in the snow? This picture was taken in northern Alberta, Canada, just south of the Northwest Territories border. Leave your best guess in the comments, and no they aren’t cross country ski tracks!